One of my friends recently sold a couch on Craigslist. That certainly isn’t a novel idea. A lot of people unload their old things on Craigslist. It’s easy and local. But, what if I told you that they bought those couches on Craigslist 3 years ago? And that they sold the couches for more than they paid for them? They actually netted $100 and got great usage out of the couch for years! This might not sound like a monumental money saving moment, but think about the way most people approach furnishing their home. Most people go to one of the big box furniture stores or maybe take the trek to Costco. Often they pay thousands for a new bedroom set for their house or for a kitchen table with a buffet. On top of that, lots of Americans opt for the financing option that the store offers. In addition to a long list of drawbacks, if consumers don’t pay financing options off on time they end up paying a ridiculous amount of interest. Add to this the extra factor of knocking your credit score down anywhere from 5-35 points and the fact that this could look bad on your credit report for some time. Boy this furniture purchase is starting to look like more of a hassle than it’s worth. I get how fun it is to go furniture shopping. It definitely feels good to go into the store and pick out something brand new, something no-one else has ever had in their home, something pristine. Later that week the delivery guys come by with your new furniture wrapped in plastic. You position it perfectly and sit back to admire your new look. How long does that feeling last though? Psychologists have done numerous studies on how consumerism affects our level of happiness. There is certainly a great initial high when you get that new piece in your house. But it doesn’t last long. Pretty soon that new couch sinks in a bit too far or has a little stain on it that annoys you. Or even worse, you find a piece that you like more two weeks later. We all know that cars depreciate in value when you drive them off the lot. Guess what – most furniture does too! Think outside of the box next time you go furniture shopping. Craigslist is full of folks that are looking to get rid of their gently used furniture. Take the discount. Don’t fall into the cycle of coveting that new piece of furniture. My wife and I also purchased a couch recently at a store’s scratch and dent sale. It was $40. And we love it! It needs a tiny amount of TLC but we are happy to do it. So, let someone else take that hit to the wallet and start thinking about your furniture as a potential profit turner! So smart. Definitely worth the thought. Great post and vey smart!! 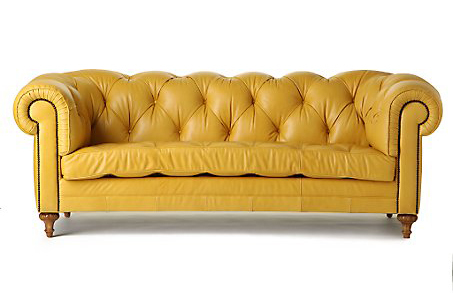 I’m so glad that I’ve just read this, as we are currently on the hunt for “the perfect couch”! we will be looking for “new” furniture when we get back to Atlanta and there are great deals to be had other than retail! There is no shame in my game. The wife and I have bought more than one piece of furniture at a discount because of dents/scratches and I have saved some money by haggling on price and delivery cost.